Mark Viduka to leave Leeds United at the start of an English Premier League campaign to play for Australia in a meaningless Olympic Games? That was the reaction of hardened soccer supporters and ordinary Australian sports fans who have learned through bitter experience that clubs usually get their way in a club-versus-country war. But there were others who know Viduka better and simply nodded knowingly when the V-Bomber declared that his appearance for the Olyroos was never in doubt – even if he was going to miss glamor Champions League games at Barcelona and Milan. They included Tony Dunkerley, the coach who recognised Viduka’s talent even as a 13-year-old and took him on his first overseas trip to represent Victoria – in what was loosely termed the World under-13 Games in Japan. “He was focused even as a 12-year-old,” Dunkerley said yesterday. “It was nothing new to me when I read what he said when he arrived. At 12 he was proud of his club and his parents – he was always patriotic. The Victorian team that Dunkerley took to Japan reached the semi-finals before losing to the eventual winners. From there, Viduka played for Victoria at every junior level, gained a scholarship at the Australian Institute of Sport, then returned to his home club Melbourne Knights in the National Soccer League. At Leeds United, Viduka pockets $57,000 a week, is playing in front of packed grounds every week, and is watched by a global audience that religiously follows the weekly highlights package of the English Premier League. It’s a far cry from the contract that earned him $120 a match at the Knights, and a vastly different dressing room he walked into when contributing to two NSL titles. Knights captain Andrew Marth said the side included several hardened characters who invariably gave rookies baptisms of fire. “He was young and immature and he came into a very competitive team with a lot of good players, and he had to grow up very quickly,” Marth recalled. “There was no question of his ability. There was his strength, his aerial ability, he was two-footed and for his size, he was very quick. He was a complete centre forward. “But in the dressing room, as the new kid, he was the target of quite a lot of mickey-taking. The big movie at the time was Forrest Gump and we nicknamed him Forest for a couple of months. “But he was a tough western suburbs kid and he shrugged it all off. His record on the park speaks for itself, but he had a great feeling for the club. 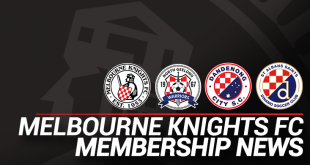 He had supported the Knights growing up and he got his biggest pleasure out of scoring goals against South Melbourne, who were always our biggest rivals. “He was more of a team guy and became one of the boys, one of the top five in the team. He would go out with us for a drink after a game. He was no different from the lads – he never had a big head. At the Knights, Viduka was top scorer in the NSL for two successive seasons, won a championship and was voted the NSL under-21 player of the year as well as twice winning the Warren Medal as the league’s best player. The Knights pocketed $2 million from his successive transfers to Dinamo Zagreb in Croatia and Glasgow Celtic. He arrived from Europe late on Friday night and only spent one night with his family in Keilor Downs before joining the Olyroos at their base at the Hilton. He admits he is in a dilemma of being so close to home without being able to really go home. “It’s good to see the family and it’s good to see Melbourne again,” he mused. “It’s a good feeling when you land at Melbourne airport and your family is there waiting for you. “And it’s hard to be so close and yet so far. I’m in Melbourne and I’ve only spent one night with the family. The longing for family was best illustrated when he put his $8 million transfer to Celtic in jeopardy soon after signing to spend Christmas here. But anyone who questioned his character and mental toughness was given a quick response as Viduka took the Scottish league by storm, finishing top scorer and being named the Scottish player of the year. “You have to be strong, you have to know why you’re there,” Viduka explains. Viduka said the four seasons he spent in Croatia hardened him as a player and sorted out his loyalties. “My experience in Croatia changed me a lot. I think that after that I realised that my career was number one – to do well in football. “I was born and raised here. I love this country, I think it’s the best country in the world. And I think I am a person who can help the country do well in football – it’s not the No. 1 sport here, and maybe I can be an example for the young kids who may want to play for Australia. Having been raised in a town that is AFL mad, his big thrills have come when soccer has become the showcase in this town – and in particular on the two big occasions at the MCG against Iran and Brazil when the Socceroos played to packed houses. Tonight is the next big stage for Viduka, and he has no doubt the hometown crowd will play a big part in the occasion. Asked whether Australia should play a cautious defensive game against what is regarded as a stronger, vastly experienced Italian side, Viduka smiles. “I think it will be difficult to be cautious at the MCG, judging from the games before,” he said.